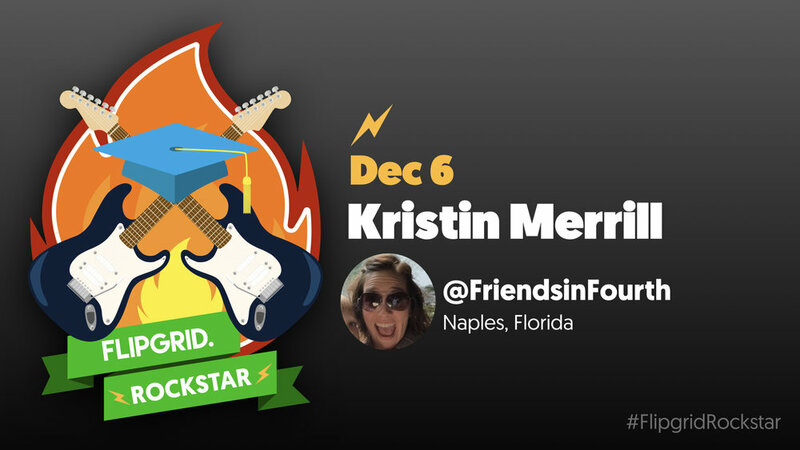 Kristin Merrill, a fourth grade English Language Arts Teacher, has been rockin' out Flipgrid for over a year! She is a Flipgrid Certified Educator & Flipgrid Ambassador who always gives her heart and time to encourage and support teachers as they implement Flipgrid, including teachers within her school district and throughout the world via Twitter. She contributes greatly to the Flipgrid community and currently has the most "used" topics in the Flipgrid Discovery Library. Kristin is also an organizer and co-moderator of the hottest Twitter chat on the planet: #FlipgridFever ðŸ”¥ðŸ”¥ðŸ”¥. Although Kristin's family and school district were affected by hurricanes this fall, she stayed connected to make sure students were safe and kept her students engaged in learning while out of school by using Flipgrid ðŸ™Œ. To Kristin, Flipgrid is "flexible" and "universal!" Flipgrid creates a sense of community. It allows the kids in class to communicate with each other both at school and at home. It has also helped me as a teacher to hold students more accountable during the day. Start small. Find one way to use it each week. From there, keep adding in new ideas and new activities each week.